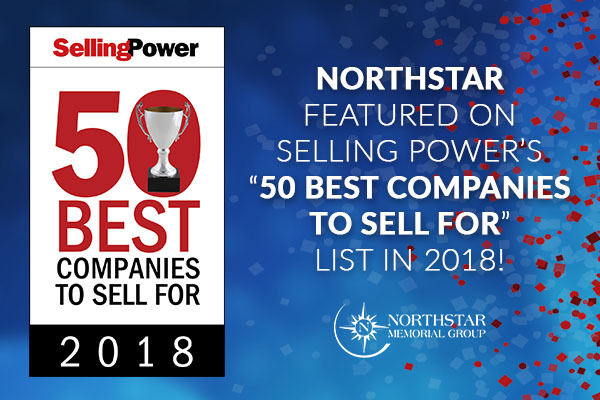 NorthStar Memorial Group remains on Selling Power magazine’s exclusive list for the second year in a row as one of the best companies to sell for in 2018. Each year, the magazine’s corporate research team assembles and publishes the Selling Power 50 Best Companies to Sell For list. This is the 18th consecutive year the list has appeared in the magazine. The list encompasses companies of all sizes — with sales forces ranging from fewer than 100 salespeople to companies with sales-force numbers in the thousands. Find out what it takes to be part of our winning team. In addition to Selling Power magazine, the leading periodical for sales managers and sales VPs since 1981, Personal Selling Power, Inc., produces the Sales Management Digest and Daily Boost of Positivity email newsletters, as well as a series of five-minute videos featuring interviews with top executives. Selling Power is a regular media sponsor of the Sales 3.0 Conference.